Welcome to the NBA Finals ~ Roundball Manor - The House that Basketball Built. With a bevy of story lines looming this year, Roundball Manor gets right to the match ups, assessing each team's strengths and weaknesses that we're sure to see in this seven game series. Westbrook has pretty much been unstoppable this postseason, improving his shot selection, limiting his turnovers, and increasing his assist totals getting teammates involved early and often. He steamrolled through Dallas, LA, and San Antonio in leading one of the greatest playoff runs we have seen in a long time. He will need to continue attacking Miami this series, getting to the line and controlling the pace of the game. For Chalmers to be effective this series he HAS to knock down those open three pointers. He gets plenty of good looks and if they start falling, OKC will be forced to play him on D, opening up the floor for LeBron and Wade to operate. Advantage- Westbrook. But don't be surprised to see D Wade covering Westbrook at key points in this series. Sefolosha needs to make the most of his time on the floor, knocking down threes and playing great defense. His numbers will be limited with Harden playing crunch minutes, but he needs to contribute when he has the opportunity. Wade must wake up the ghosts of playoffs past and ball like the Finals MVP from 2006. His season has been up and down marred by injuries and an inconsistent playoff run. Wade must feed off of LeBron and continually push the ball, finding open spaces and getting to the line. If he can get hot early in this series and get OKC in foul trouble, he could help his team steal a game on the road and altar the series in their favor. Advantage- Wade. Even though Harden will be going up against him in the 4th quarter, Wade still has the intangibles and championship DNA at the two guard. LeBron James has continued his dominance this season earning his third MVP in four years. His numbers continue to improve, shooting over 50% from the floor this year. He has elevated himself these playoffs, carrying his team to victories over Indiana and Boston. He will have to use his size and strength to out power Durant on both sides of the ball. 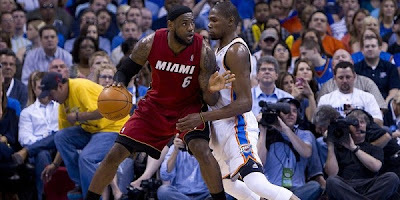 With his size advantage he should go at Durant all game, causing double teams and miss matches for the Thunder. Because of this, don't be surprised to see Sefolosha, Harden, and even Ibaka guarding LeBron. Its will take the entire team to slow him down. However, for LeBron to be successful he is going to have to get all of his teammates involved more, setting them up for easy and open looks. If he gets 10 assists per game, the Heat will win. Durant has been shooting the lights out of arenas all season long, and don't expect him to stop now. After becoming the youngest scoring champion ever in 2010, he has followed that up as a three time scoring champion and a clutch, cold blooded, knock down, ice-in-his-veins sniper scorer. His combination of size and range has made him an unstoppable weapon offensively. He will be tested to the limit guarding James this series, and will need to prove that his game is not one-dimensional. Look for Durant to slide over and guard the likes of Battier or Mike Miller, depending on match ups, and expect him to have the ball in crunch time at the end of each game. Advantage- James. Reigning MVP has too much size and strength and will impose his will. However, look for Durant to counter punch with clutch three pointers and jump shots from all over the floor. Bosh has been a quiet contributor all season long, so expect him to make some noise this series. After being overlooked and undervalued all season, Bosh finally garnered respect in the Boston series when the team struggled without him on the floor. He creates tons of space in the middle, forcing the opposing team's big man to guard him out on the perimeter. He is one of the best jump shooting bigs in the league and will have plenty of chances to score this series. For Bosh to be truly effective this series, he is going to need a double double and help his team out rebounding, blocking shots, and being a presence in the paint defensively. Ibaka has had a tremendous season, leading the league in block shots and playing solid interior defense. He has a very underestimated jump shot and can pass and spread the floor as well. His job will be to keep Chris Bosh out of the paint and off of the stat sheet. Advantage- Bosh. His ability to stretch defenses will test Ibaka to his limits. Expect a big series from Bosh. Anthony will also have to make the most of his minutes on the floor, playing tough defense, rebounding and blocking shots. With a limited offense, Anthony will have to make his presence felt in the paint, something the Heat have been missing this season. Perkins plays solid defense, and has the prototypical size and strength for a center that teams are looking for in the NBA. He will force James and Wade to pass on their drives and will alter plenty of other shots with his presence alone. If he can stay out of foul trouble, Perkins should impact the game defensively. Advantage- Perkins. He's been here before with the Celtics twice and knows what it takes to win. Sixth man of the year James Harden leads the Thunder bench but plays starter minutes. His range and ability to get to the line will keep Miami busy all series. With the driving abilities of Harden, Westbrook, and Durant, look for Derek Fisher to spot up for open three pointers. If he can knock those down it will spell serious trouble for Miami's defense. Advantage- OKC. Harden and Fisher are integral parts to the teams success and will be hard for Miami to stop. This series is going to see several different looks and match ups as both teams try to find the best lineup for success. Expect Chris Bosh to play major minutes along with Battier in a smaller back court, as Miami will try to use their speed and shot making ability to take Ibaka and Perkins out of the game. For that to happen, Miami MUST knock down their open shots. The Thunder will not stop LeBron James, they can only hope to contain him. They will double him and force the ball out of his hands as much as possible, so it is imperative for his teammates to take advantage early. Dwayne Wade must become just as dangerous as James for Miami to have a chance. On the other side the Thunder have one of the most daunting lineups in recent history, a lineup that features Durant, Westbrook, Harden, and Ibaka all UNDER 23. Their combination of elite weapons is a nightmare for teams and they proved it by knocking out Dallas, Los Angeles, and San Antonio in an impressive fashion. Expect them to do it again this series. Final Prediction- Thunder in 7 games. LeBron is the best player in this series, but the Thunder have the most complete team and more weapons. Their interior defense will prove to be too much for Miami to overcome.